A new Initial D music album is going to be released soon. 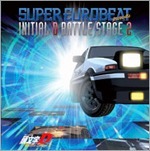 The album is called Super Eurobeat Presents Initial D Battle Stage 2, on sale by September 5th, 2007. This new album consists of two CDs, with 12 tracks on each. The tracks are all from Initial D Battle Stage 2. If you liked the music from Battle Stage 2, make sure you don't miss out on this. We'll be providing some samples for download when it is out. Due to popular demand, m.o.v.e's debut album electrock has been re-uploaded. I strongly urge you to purchase this album if you a m.o.v.e fan or just like the 90s' JPop culture. The album itself is 10 years old but it sure doesn't sound like it. Famous tracks like around the world, Rage your dream are also included in this album. MP3 Section updated. Total number of downloadable MP3s is now 215.